An astronaut image of Dublin City Centre obtained just after midnight on 26th January 2008. 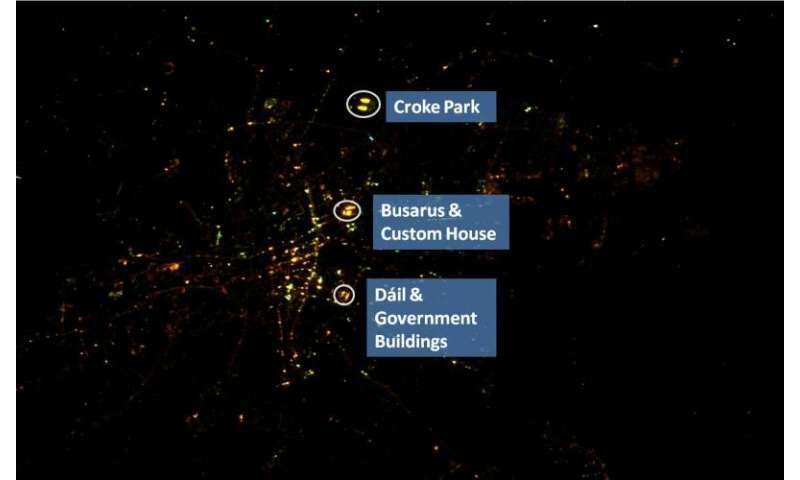 A considerable amount of detail is visible with the grow lights at Croke Park, Busarus and the Custom House, as well as the Dail and Government Buildings areas being clearly visible. Image courtesy of the Earth Science and Remote Sensing Unit, NASA Johnson Space Center. Light pollution is costing us hundreds of thousands of euro each year, as well as impacting environmental processes and affecting our health. That is according to Professor in Physics at Trinity College Dublin, Brian Espey, whose work has moved from monitoring the heavens to protecting our skies as part of our natural heritage. Public lighting is estimated to account for 15% to 35% of a local authority's energy use, while figures show that the 420,000 or so streetlights in Ireland use a total of 205 GWh of electricity annually, which costs €29 million and produces 110,000 tonnes of carbon dioxide. But as much as 20-30% of this energy could be wasted through poorly designed or inefficient lighting and the illumination of areas where light is not needed. To estimate the potential energy and economic cost of light waste, Professor Espey and colleagues measured light falling on the ground at locations away from directly illuminated areas (e.g. away from streetlights), and recorded the light scattered back onto the ground from the air. Measurements were taken on clear nights over a 1,000 square km area from Dublin City Centre southwards into the Wicklow Hills. Light from Dublin City dominates the natural sky background even in heritage sites such as Glendalough, some 45 km away, as well as other parts of the Wicklow Mountains National Park. Using these data, Professor Espey and his team estimate that over 2.2 GWh (2.2 million "units") of electricity is wasted in providing diffuse illumination of areas such as back gardens, public parks, woods and mountains at an estimated cost of €300,000 annually. Scaled up by the light emission of other Irish cities, this amounts to a cost of 3.3 GWh, or an annual Property Tax burden of €460,000, but these measurements underestimate the true figures as light escaping directly to space has not been factored into these calculations. "When we look at images from the International Space Station, such as those tweeted by Cmdr. Chris Hadfield when he flew over Ireland, we generally do not think that the light that a few astronauts see at 400 km above the Earth is just a small sample of the total that is outgoing to space, never to return," said Professor Espey. We can, however, get some appreciation of this amount through the simple observation that both the sky and our back gardens are much brighter when overcast. Clouds act like mirrors, reflecting back light that would normally escape from the Earth. When the sky is clear in the City Centre the scattered light coming back down is 30-40 times the natural sky background, but this increases to 400–1,000 times during overcast conditions. Work has begun to extend the estimates through using a combination of ground- and space-based observations. The NASA SUOMI spacecraft, which flies over the island of Ireland at half-past midnight every night, has allowed the team to compare the upward light from towns in the Republic with similar-sized towns in the North. Northern Ireland has managed to reduce light waste by roughly a third, on average, so we could expect similar savings here, although differences may be due to a combination of lighting efficiency and the reduction of light after midnight due to difference lighting practices. Professor Espey added: "County Councils are aware of light waste and pollution, but there is still room for improvement and more could embrace improved light pollution controls as part of their environmental agenda. Most public lighting in Ireland is unmetered and uses relatively old technology, but the push towards newer lighting types such as LED technology in full cut-off lamps, and improved lighting practices such as "trimming and dimming" could see the situation improve in the medium term." In addition to the financial burden of light pollution, the impact on animals from bats to insects is well-known, but human health also suffers in a variety of ways in the presence of excessive light levels; some studies even suggest that increases in cancers occur in neighbourhoods that are overly lit at night. Humans - just like other animals and plants - have been conditioned over millions of years to rely on circadian rhythms, which are controlled by natural light-dark, day-night transitions. If the environment remains brightly lit then the night-time mode of repair and replenishment cannot occur as is required, and potentially harmful free radicals build up in our systems. Professor Espey added: "Before the next cycle of building commences we should be considering just how bright we are to pay astronomical sums to send energy out into the countryside and, even worse, out into the cosmos. Like everything, this excessive lighting has costs – in this case, pretty serious environmental, economic, and health-related ones."